To develop solutions quickly and efficiently, it is important to be always close to our customers. In addition to in-depth knowledge of the industry and extensive product know-how, it is above all the proximity to each other that makes working together effective. That is why ALTEN Austria is building up a close network of locations in Austria. All our locations in Austria are listed below. ALTEN subsidiaries are located in Vienna and Graz. The city of Linz is among our sites of operation. Here, our employees work directly at the customer’s site. We will let you in on what makes living and working at our locations so appealing. Find the ideal job for your preferred location. What makes Vienna attractive as a place to work and live? We’ll tell you! 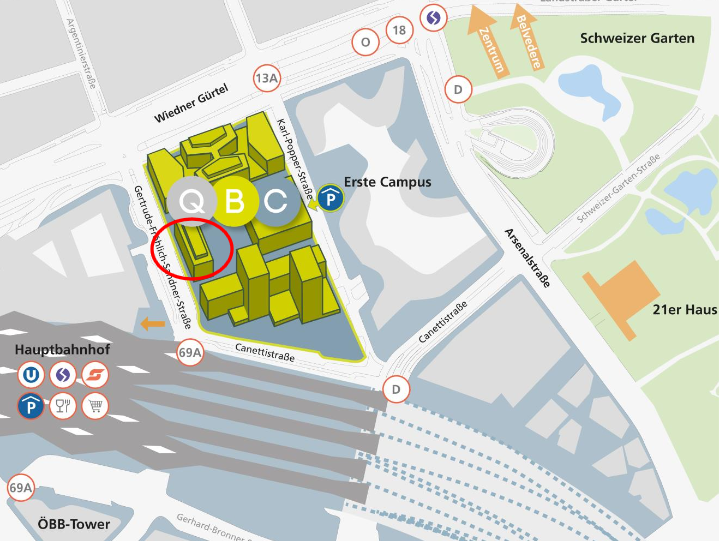 You will find our office in Building 3 (6th floor) of the Quartier Belvedere Central, near Vienna Central Station. What makes Graz attractive as a place to work and live? We’ll tell you! What makes Linz attractive as a place to work and live? We’ll tell you!